This gripping account begins with the fire’s destruction of Wallace, Idaho. What kinds of things make people late to the evacuating train? What would you bring with you if you were allowed only a case small enough to fit on your lap? With so much animosity between Pinchot and Roosevelt’s young Forest Service and the “robber baron” businessmen, what ultimately brings people together to fight the Big Burn of 1910? How does Congress—still controlled by powerful business interests—fail the rangers and citizens of the West after the fire has finished raging? Egan details the childhood and early careers of both Teddy Roosevelt and Gifford Pinchot in order to give readers a fuller picture of why and how these men came to pioneer conservation as a national value in America. In what ways do Roosevelt’s experiences shape his politics? How do Pinchot’s experiences influence his work as “Big G.P.” of the Forest Service? Roosevelt and Pinchot are very different types of men, and yet they share a passion for the great outdoors. What do Roosevelt and Pinchot have in common? How are they different from one another? Throughout the book, Egan reveals that some powerful men whose hubris and greed would decide the fate of America’s still-untamed West spend time in that region, while others distance themselves both literally and figuratively. Discuss the relationship these men have to the land they all but rule over and the way Egan portrays them. On page 112, Egan quotes Chief Joseph of the Nez Perce tribe as wondering, “Why are you in such a hurry?” He’s referring to the rush of “manifest destiny,” with America’s population exploding from colonies of 2.9 million people to an ocean-to-ocean nation of 91 million. In the first decade of the twentieth century alone, the populations of Idaho and Washington doubled. Discuss the effect this rapid growth has on the young nation—why are they in such a hurry? What does it cost them—and us? In many ways, the battle against the forest fires of 1910 is a war of the disenfranchised. Identify the players and discuss their roles in this epic disaster. Why do you think they answer the call for labor when those with the most at stake—such as the “idle men” of Wallace—do nothing? Gifford Pinchot firmly believed that man could control forest fires, though he’d never seen anything like the Big Burn of 1910 when he published his A Primer of Forestry in 1900. What methods do the rangers and townsfolk use to try to control the fires? What methods do they use to survive? 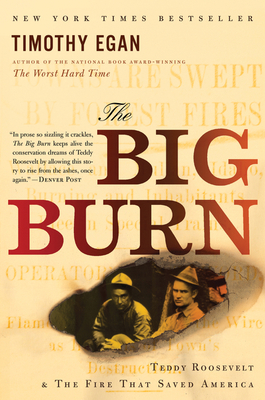 The aftermath of the Big Burn seems like one colossal governmental failure, though some bright spots exist, such as the sea change in many Americans’ opinions about the black “buffalo soldiers” who became heroes in Wallace, Idaho. How does Egan’s portrayal of this seminal moment in American history make you feel? Did it change your mind about anything, or teach you anything new? William H. Taft is portrayed as a complicated man in this book. He idolizes Roosevelt and yet fails to keep his promises to him; on page 246, Egan describes how he publicly attacks T.R. in an effort to save face, but retreats afterward to weep in private. Do you feel any sympathy for Taft? Why or why not? Ten days after the fires die down, infuriated by Taft’s betrayal of his predecessor’s conservation efforts, Teddy Roosevelt takes to the bully pulpit once more to pioneer a “New Nationalism.” What does this term mean to him and to his supporters? Discuss how some of these principles may still be seen alive and well in today’s America and how others have not quite taken hold. In the final chapter of the book, Egan describes the current landscape of what was once several national forests in Montana, Idaho, and Washington. He shares how the Forest Service still carries “the Pulaski” as their prized firefighting tool, and how the great “Milwaukee Road” is now gone, its tracks pulled up and sold for scrap. Towns like Avery, Taft, and Grand Forks are now gone or reduced to wilderness outposts. What effect does this chapter have on you, and what message do you think the author hoped you would come away with?